Having finished with Spain, we move on to Germany in our consideration of the Offertory Rites of the medieval Uses. I have grouped Utrecht and Liège with Cologne, even though they are now in different countries, because they were formerly its suffragans, along with Cambrai, Münster and Osnabruck. 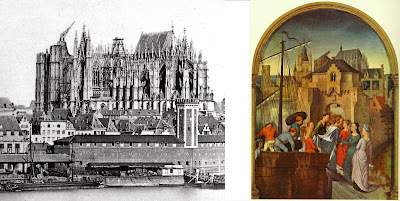 Both before and after the Counter-Reformation period, the bishops of Cologne and Liège were also secular princes, the latter being furthermore ex-officio among the Electors of the Holy Roman Empire. The desire to maintain their identity as separate political entities may have had something to do with the fact that, unlike the majority of sees and canonical chapters, neither availed themselves of Pope St Pius V’s permission to adopt the Roman liturgical books promulgated after the Council of Trent. 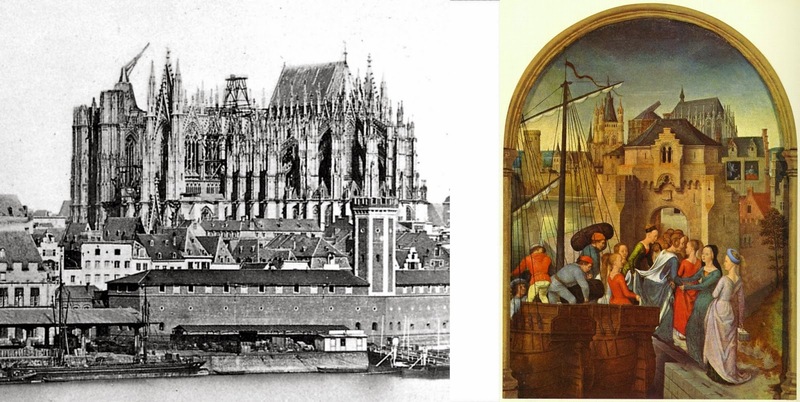 The See of Cologne, however, reformed its books on the neo-Gallican pattern in the later 18th century, while the Use of Liège disappeared when the prince-bishopric was overrun by France during the revolution; both adopted the Roman Use in the 19th century. Like most medieval Missals, the Missal of Cologne, printed in 1494, has no Ritus servandus, the long rubric describing in detail the celebration of Mass. The texts of the Offertory are printed with very simple rubrics, and no mention is made of incense; this must not be taken of course, to mean that it was not used. The now apparently defunct Bund für Liturgie und Gregorianik published the Ordo Missae from a 1525 edition of the Cologne Missal, which gives some material not included in the 1494 edition available at the website of the Bayerische Staatsbibliothek. As was commonly done in the medieval Uses, the chalice was prepared during the singing of the Epistle. The rubrics simply says “In preparing the chalice let (the priest) say. ‘In the name of the Father, and of the Son, and of the Holy Spirit. Blood came forth from the side of Our Lord, Jesus Christ.’ ” This would be for the pouring in of the wine; at the water he says “And water, for the forgiveness of sins. May this mixing of wine and water together be done in the name of the Father etc.” This is followed by the prayer Deus qui humanae substantiae, as in the Roman Offertory. None of this is printed in the 1494 edition of the Cologne Missal. Bowing reverently, and with joined hands, he says the Cologne version of Suscipe Sancta Trinitas. Suscipe, sancta Trinitas, hanc oblationem, quam tibi offerimus in memoriam passionis, resurrectionis et ascensionis Domini nostri Jesu Christi: et in honorem Sanctissimae Dei Genitricis Virginis Mariae, et N., atque omnium sanctorum tuorum, qui tibi placuerunt ab initio mundi; ut proficiat illis ad honorem, nobis autem et omnibus fidelibus, vivis et defunctis, ad salutem, et ad remissionem omnium peccatorum; et ut illi omnes pro nobis intercedere dignentur in caelis, quorum memoriam agimus in terris. Per eundem Christum, Dominum nostrum. Receive, o holy Trinity, this offering, which we offer to Thee in commemoration of the Passion, Resurrection and Ascension of our Lord Jesus Christ, and unto the honor of the most holy Mother of God, the Virgin Mary, and N. (presumably the Saint of the day) of all Thy Saints who have pleased Thee from the beginning of the world; that it may profit unto their honor, and to us, and all the faithful, living and deceased, unto salvation, and the forgiveness of sins; and that all those, whose memory we keep on earth, may deign to intercede for us in heaven. Through the same Christ, our Lord. Turning to the people, he says, “Orate pro me peccatore, fratres et sorores, ut meum pariter et vestrum sacrificium acceptum sit omnipotenti Deo. - Pray for me a sinner, brothers and sisters, that my sacrifice and yours may be accepted of almighty God.” As in many other medieval Uses, no response is made. The See of Utecht in the modern Netherlands is fairly ancient, founded by St Willibrord at the end of the 7th century, and was a major center for the evangelization of the Low Countries. Nevertheless, it remained a suffragan of Cologne until 1559. In the Missal according to the Use of Utecht printed at Antwerp in 1540, the Offertory differs only very slightly from that of the Use of Cologne. The rubrics are very slight, and say almost nothing about the ritual actions that accompany them; as at Cologne, there is no mention of incense. We may safely presume that the chalice was prepared during the Epistle as at Cologne and elsewhere. The Offertory begins at the words “In the name of the Father... What shall I render...” noted above; none of the material noted above before that point is printed in the Missal. The one unique feature of this Use is that the elements are blessed at the prayer In spiritu humilitatis, again, following a text almost like that of the Dominican Use. “In a spirit of humility, and contrite heart, may we be received by Thee, o Lord; so that + our sacrifice may take place in Thy sight this day, in such wise that it be received by Thee, and please Thee, o Lord.” The prayer Veni, invisibilis Sanctificator is said before the Suscipe Sancta Trinitas, as in the 1525 edition of the Cologne Missal. The Suscipe Sancta Trinitas is longer than at Cologne, but the variants are common to other Uses. Suscipe, sancta Trinitas, hanc oblationem, quam tibi offerimus in memoriam passionis, resurrectionis et ascensionis Domini nostri Jesu Christi: et in honore Sanctissimae Dei Genitricis Virginis Mariae, et sanctorum, quorum hodie festivitas celebratur, et quorum hic nomina et reliquiae habentur, necnon et omnium sanctorum tuorum, qui tibi placuerunt ab initio mundi; ut proveniat illis ad honorem, nobis autem et omnibus fidelibus, vivis et defunctis, ad salutem, et ad remissionem omnium peccatorum. Et ut illi omnes pro nobis intercedere dignentur in caelis, quorum memoriam facimus in terris. Receive, o holy Trinity, this offering, which we offer to Thee in memory of the Passion, Resurrection and Ascension of our Lord Jesus Christ, and in honor of the most holy Mother of God, the Virgin Mary, of the Saints whose festivity is celebrated today, and whose names and relics are kept here, and also of all the Saints who have pleased Thee from the beginning of the world, that it may profit unto their honor, and to us, and all the faithful, living and deceased, unto salvation, and unto the forgiveness of all sins; and that all those, whose memory we keep on earth, may deign to intercede for us in heaven. Through the same Christ, our Lord. An episcopal see in 344 A.D. was founded at the city of Tongres in what is now the north-east of Belgium, but translated a few decades later to Maastricht, now in the Netherlands. At the very beginning of the 8th century, the bishop of Maastricht, St Lambert, was martyred; the reason is not agreed upon in his different biographies, but devotion to him was very great throughout northern Europe. His successor, St Hubert, brought his body to Liège, and built a basilica to house his relics, and the See of Maastricht-Tongres was then transferred there. As mentioned above, it retained its proper Use until the very end of the 18th century, although its liturgical books were revised in some respects on the model of the Roman Tridentine books. The Missal I follow here was printed at Speier in Germany in 1502. As in Cologne and Utrecht, the rubrics are fairly sparse, saying nothing about the preparation of the chalice; however, the prayers accompanying the incensation are given. 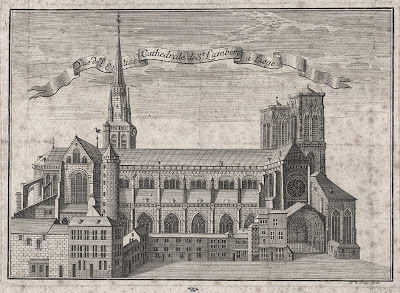 The Cathedral of Saint Lambert in Liège, from an engraving of 1735. The building was begun after a fire destroyed an earlier structure in 1185, and completed in 1433. 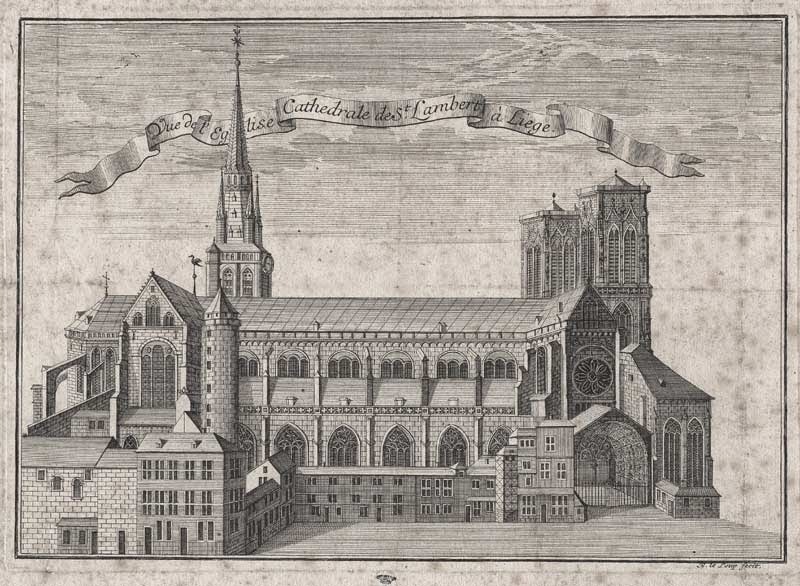 It was destroyed over the course of several years, beginning in 1794, in the wake of the French Revolution and invasion; the collegiate church of St Paul has served as the city’s cathedral since 1812. The Offertory begins with the priest at the middle of the altar, saying with hands joined “Veni, quaeso, sanctificator, omnipotens aeterne Deus - come, I ask, o sanctifier, almighty eternal God”, and then making the sign of the Cross over the chalice as he says “Et bene+dic hoc sacrificium tuo tibi praeparatum. - And bless + this sacrifice prepared unto Thee.” He joins his hands again and says, “What shall I render...” as above, then takes the chalice with the paten on it in his hands and says, “I will take the chalice of salvation...”, again as above. Suscipe, sancta Trinitas, hanc oblationem, quam tibi offerimus in memoriam incarnationis, nativitatis, passionis, resurrectionis et ascensionis Domini nostri Jesu Christi: adventusque Spiritus Sancti: et in honore sanctae Mariae Virginis, et omnium sanctorum, ut illis proficiat ad honorem, nobis autem ad salutem, et omnibus fidelibus, vivis et defunctis; illique pro nobis intercedere dignentur in caelis, quorum memoriam facimus in terris. Per eundum Christum Dominum nostrum. Amen. Receive, o holy Trinity, this offering, which we offer to Thee in memory of the Incarnation, Birth, Passion, Resurrection and Ascension of our Lord Jesus Christ, and of the coming of the Holy Spirit, and in holy Mary the Virgin, and of all the Saints that it may profit unto their honor, and to us, and all the faithful, living and deceased, unto salvation; and may those, whose memory we keep on earth, deign to intercede for us in heaven. Through the same Christ, our Lord. Amen. Bowing before the altar, he says the prayer In spiritu humilitatis as at Cologne. The Orate fratres is slightly different from the Cologne version. “Orate pro me fratres et sorores, indigno famulo Dei, ut meum pariter et vestrum sacrificium acceptum sit omnipotenti Deo. - Pray for me, brothers and sisters, the unworthy servant of God, that my sacrifice and yours may be accepted of almighty God.” No response is made.